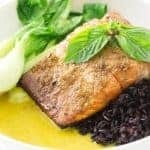 A delicious Thai yellow curry paste made from scratch that rivals your favorite Thai restaurant. 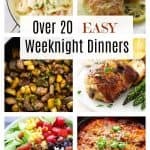 It can be made in just 20 minutes and makes enough to use in 10 different curry recipes. 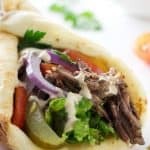 Don’t be intimidated by all the ingredients in this recipe. Some of them might not be familiar to you but they are easy to find. Our local grocery store has everything but the shrimp paste which you can get online or at a nearby Asian market. All the different seasonings work together to make a complex balance of flavors that will blow your mind. This is a concentrated curry paste, not a ready-to-eat curry sauce. You use this paste to make a curry sauce that will rival your favorite Thai restaurant. The recipe will make enough curry paste to use in at least 10 different recipes. Did I say the flavors are concentrated? So, you spend a little time up front prepping the ingredients and making the yellow curry paste, then you sit back and enjoy it ten-fold! 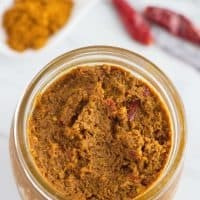 Freezer Friendly Thai Yellow Curry Paste! No worries if you don’t plan on eating ten curry dishes in the next three days. This stuff freezes. You can keep this curry paste in the fridge for two to three weeks. Any longer than that and you should freeze it. The best way to freeze this Thai yellow curry paste is to portion it out into ice cube trays. A standard ice cube tray will hold about two tablespoons in each little cubicle. 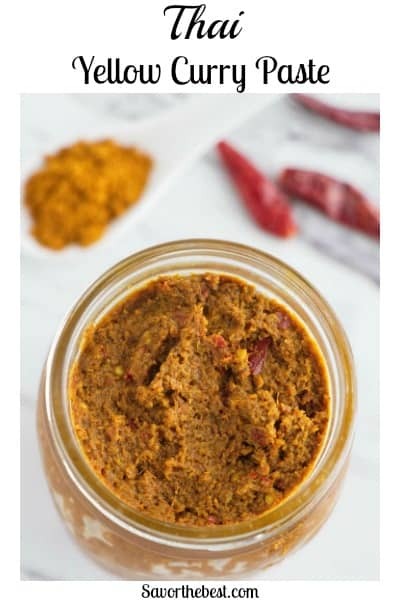 Perfect because you only need two to three tablespoons of curry paste for most recipes. I pile the paste up pretty high and pack three tablespoons in each ice cube compartment. If you like your curry dishes on the mild side then just add two tablespoons to each compartment. Once the curry paste is frozen then pop them out of the ice cube tray and toss them in a re-sealable freezer bag. Now you have fresh, homemade Thai yellow curry paste ready for your next restaurant quality meal. This yellow curry paste is a game changer. Yes, you can make some pretty amazing and authentic Thai curry dishes with it. But don’t stop there. This stuff adds flavor to everything. 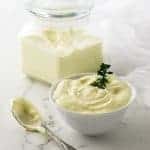 Mayonnaise (it makes an amazing sandwich spread). Steamed, roasted or stir-fried vegetables. Or make some amazing mind-blowing curry sauce! 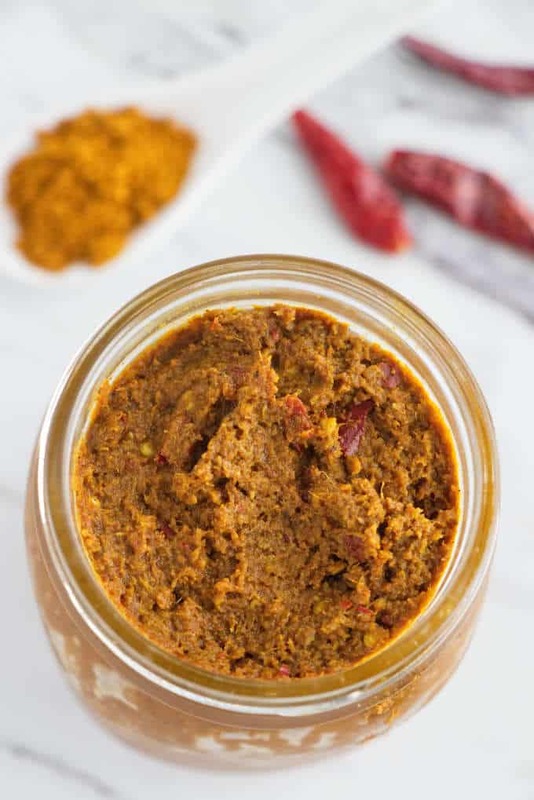 Now that you have your flavor packed curry paste made, you are ready to make some AMAZING curry sauce. Heat the curry paste until it releases all the wonderful smells then pour in two cups of coconut milk and a couple of teaspoons of sugar. If you want to give it some extra ‘oomph’ then add a dash of fish sauce. Now pour that creamy deliciousness all over some rice!! 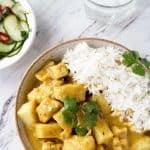 Is Thai Yellow Curry Spicy? Thai yellow curry is a mild curry but you can adjust the spicy level. If you want your curry to be even milder, blend it with a bit more liquid than your recipe calls for or use a bit less curry paste. However, if you want a spicier yellow curry then add a dash of cayenne pepper. What is Thai yellow curry paste made out of? 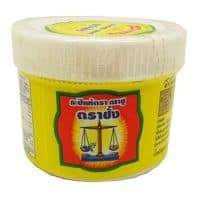 Thai yellow curry paste is made from a blend of spices, garlic, lemongrass, galangal, and shrimp paste. 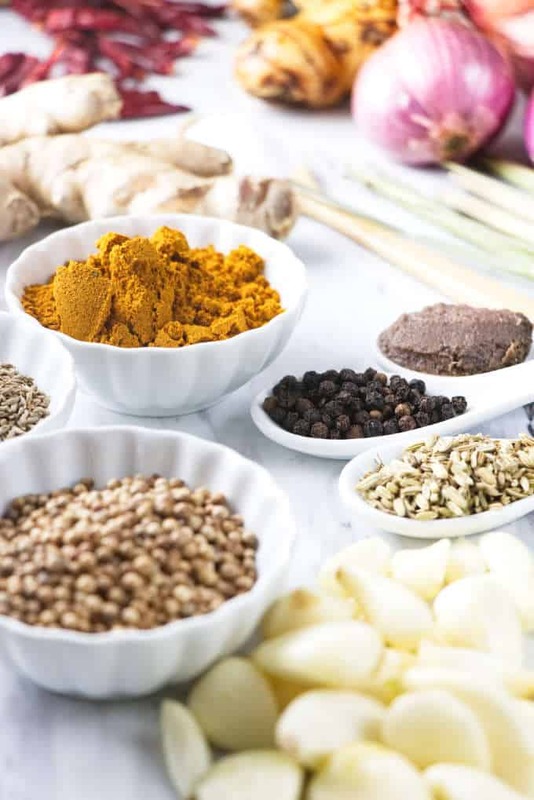 The variety of ingredients is what gives the curry such a complex flavor. It’s worth your time to find all the ingredients. We used whole seeds for the coriander, cumin, and fennel. 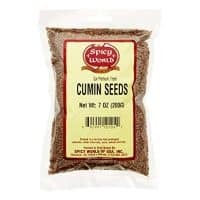 If you can’t find the whole seeds you can substitute the ground spice. If you do sub for ground spice then you should use slightly less. We have the amounts at the bottom of the recipe card. If you can find the whole seeds, it is worth getting them. The whole seeds not only keep longer, but they have more flavor than the ground spice. Curry powder is a mixture of several different spices. It varies in color and spiciness depending on the manufacturer. The most important thing is to get fresh curry powder. Since this recipe calls for such a large amount of curry, we purchased our curry powder from the bulk spice bin. It is much cheaper than the individual spice bottles. Lemongrass is a popular ingredient in Thai cooking and it is an essential flavor for this Thai yellow curry paste. Look for lemongrass in the produce section. 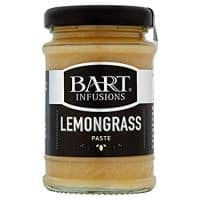 It is sold in most grocery stores but if you can’t find fresh lemongrass then you can use a jar of lemongrass paste. If you have fresh lemongrass then you only need to use the three to four inches at the bottom of the plant. The green part at the top just gets tossed. After you cut off the root and the green tops, you need to remove the tough outer layers of the lemongrass. Then give it a good wack with a meat tenderizer to release the lemony, citrus oils, and chop it up real fine. Galangal looks very similar to ginger but it has a unique flavor reminiscent to pine and citrus while ginger has a spicy and almost sweet flavor. You can remove the skin on galangal and ginger either by using a vegetable peeler or simply scraping it with the edge of a spoon. You can find galangal near the ginger in most produce sections of grocery stores but if your grocer doesn’t have any, you can buy dried, powdered galangal online. Turmeric is what gives the Thai yellow curry paste its beautiful yellow color. We used fresh turmeric in this recipe. The skin is easy to scrape off with the edge of a spoon but it is so tender, I often just leave it on. If you can’t find fresh turmeric, you can substitute dried turmeric without compromising the flavor or color. I should warn you that turmeric will leave stains on everything it touches, especially the fresh turmeric. If you don’t want orange hands, then wear gloves while you peel and grate the fresh turmeric. The turmeric will also stain the work bowl of your food processor. There are a couple of things you can do to reduce the stain. First, before you make the curry paste, coat the work bowl with some coconut oil. That will put a bit of a barrier on the bowl. You will still get a stain in your bowl, it just won’t be quite as intense. When you finish making the curry paste, clean the bowl with soap and water then soak it in diluted bleach water. 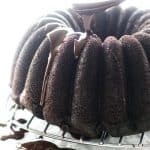 If you are like me and you make this recipe multiple times, you will end up with a permanent yellow/orange tint in your work bowl. I gave up and got a second work bowl. I save the un-stained work bowl for my photos. Shrimp paste is the most questionable ingredient in this recipe. If you have never used shrimp paste and you are not prepared for the strong smell and flavor, you will want to leave it out of the recipe. I want to convince you that shrimp paste is essential to this recipe. It amplifies the curry paste to a whole new level. Don’t leave it out. 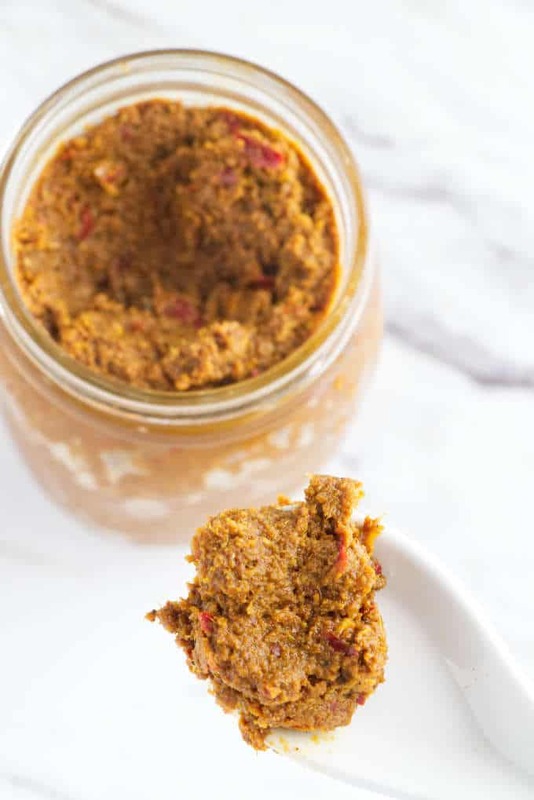 Trust me, shrimp paste will make your Thai yellow curry paste AMAZING. Shrimp paste is literally dried, fermented shrimp. You can smell it a mile away. And I don’t know anyone that likes the smell. Frankly, it smells a bit like rotten garbage and your first thought might be to toss it in the garbage. Please, please, put the shrimp paste in this recipe (unless you have a shellfish allergy). You might be wondering how something with such an intense odor and flavor can make anything taste good. It just does! 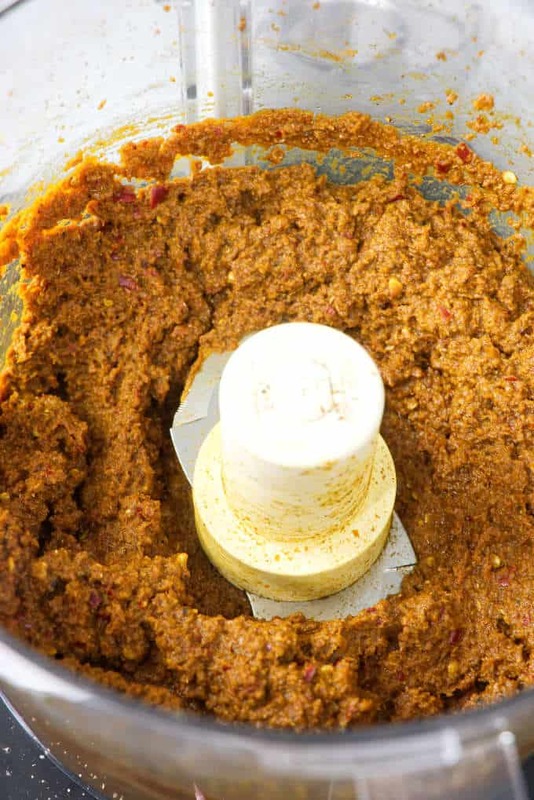 Shrimp paste blends into curry paste and many other foods to give it that special umami flavor. You will not know you are eating fermented shrimp. As a matter of fact, if you have eaten at authentic Thai restaurants, you have most likely and unknowingly eaten shrimp paste. Be brave, add the shrimp paste! 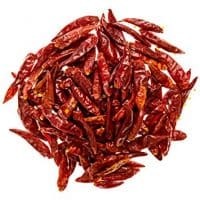 Soak the dried chiles in hot water for about 15 minutes or until they are soft. Place the coriander, cumin, and fennel seeds in a dry skillet and heat them over medium low heat. Stir frequently for 2 to 3 minutes until you can smell the toasted spices. Place the toasted spices in a food processor (fitted with a chopping blade) along with the peppercorns. Process the spices until they are powdery. Drain the chiles and place them in a food processor along with the rest of the ingredients. Puree everything until it reaches a creamy paste. You may need to turn the processor off a couple of times and scrape down the sides of the bowl. Shrimp paste adds a depth of flavor that really gives this recipe 5 stars. It really makes all the difference in this recipe. It can be found in the Asian sections of most grocery stores. If you can not find it, you can substitute with equal amounts of fish sauce. The shrimp paste has a strong odor that may make you think it has gone bad. The strong fermented odor is normal for shrimp paste and will not ruin your curry. The finished curry will not taste or smell like the shrimp paste. Trust us on this. Add the shrimp paste! Just make sure you store leftover shrimp paste in a well sealed container so it does not make the fridge smell. 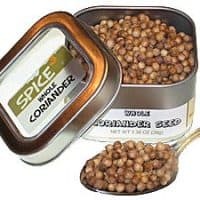 If you can not find whole seeds for the coriander, cumin, or fennel you can substitute 2-1/2 tablespoons of ground coriander, 1-1/2 tablespoons of ground cumin, and 2-1/2 teaspoons of ground fennel. Lemongrass can be found in the produce section of the grocery store. To prepare it, cut off the root and the green part, leaving only the white part of the lemongrass. Peel off the outer layers and chop it. Galangal root can be found in the produce section. It looks like ginger but it has a ‘zippy’ earthy-citrus like flavor that is unique to Thai food. Peel it with a vegetable peeler or scrape the skin off with a spoon then chop it into small cubes. Fresh turmeric is in the produce section of most grocery stores. The skin is soft and scrapes off easily with a spoon. We recommend wearing gloves because the orange color will stain your hands. The turmeric will also stain the work bowl of your food processor. A soak in diluted bleach water will remove the stain. If you can not find fresh turmeric, substitute with dried ground turmeric. Heat a tablespoon of coconut oil in a hot skillet then add two to three tablespoons of curry paste to the hot skillet. Cook the curry paste for a couple of minutes then add 2 cups of coconut milk, 2 teaspoons of sugar and a dash of fish sauce. 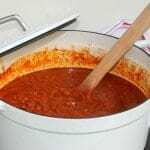 Cook the sauce until it is heated all the way then serve it as desired. It is delicious on rice.